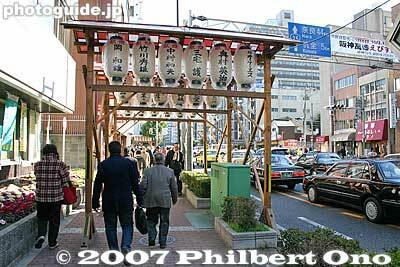 Imamiya Ebisu Shrine is dedicated to Ebisu, one of the Seven Gods of Good Fortune, representing business prosperity. On Jan. 9-11 (centering on the 10th), the shrine holds one of Japan's largest Toka Ebisu festivals to pray for good business. The festival is perhaps Japan's most commercial festival where souvenirs and trinkets for business prosperity are sold. Photo: The road from the subway station to the shrine is decorated.